This article contains facts and information about the life and times of the famous Native American Indian known as Pocahontas. Who was Pocahontas and why was she famous?Summary: Pocahontas (c.1595–1617) was famous as the daughter of Chief Powhatan who was an Algonquian chief when the lands known as Virginia were first colonized. Pocahontas befriended the English at Jamestown and according to Captain John Smith, she rescued him from death at the hands of her father. In 1612, she was seized as a hostage by the English, and she later converted to Christianity and married the English colonist John Rolfe. The following fact sheet contains interesting facts, background history and information about the life of Pocahontas and the events in history that led to his fame as a great Native American Indian leader. The story of Pocahontas started when the English settled in Jamestown in 1607. Pocahontas’ father, Powhatan, captured Captain John Smith but during the process of the captain’s execution, Pocahontas saved him. After that time, Chief Powhatan would send food to the starving Americans. 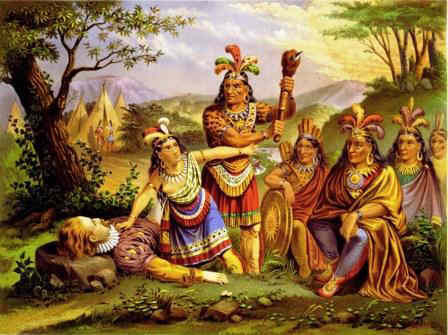 Pocahontas was sent to the Englishmen to negotiate the release of the Powhatan prisoners in which she was successful. As years passed by, the relationship between the English and the Powhatan tribe deteriorated. Chief Powhatan passed a policy to refuse any English trading due to the drought. The tribe had less food to give as the Americans were too demanding. The English burnt and threatened their tribes if their needs were not met. In 1609 tensions between the Native Indians and the English colonists increased and Powhatan reduced trade attempting to starve the colonists out. Attacks were made on the colonist's fort and the First Powhatan War (1609 - 1614) erupted. The period covering the next 2 years (1609-1610) would become known as the 'Starving Time' by the colonists. In 1613, Pocahontas was captured enabling the colonists to increase their demands from Chief Powhatan. Powhatan needed to secure the release of Pocahontas so he met with the English in the fort and brought with him the guns the tribe had taken from the other English settlers. Chief Powhatan failed to meet all the demands of the colonists so Pocahontas remained their captive. However, in April 1614 Pocahontas married English tobacco planter John Rolfe and peace returned between the warring factions. The First Powhatan War (1609 - 1614) was over. The marriage between Pocahontas and John Rolfe brought peace to both groups. She converted to the Christian religion and when she was baptized, she took the name of Rebecca. Pocahontas and John Rolfe had a son named Thomas Rolfe. In 1616 she accompanied her husband on a visit to his home in England. Pocahontas was extremely popular with the English and she met with the highest in the land including Queen Anne and King William who showed her the greatest respect. When she was ready to sail for home, she contracted tuberculosis and died. She was buried on March 21, 1617 at St George's Church, Gravesend, Kent, England. Find some more important information and interesting facts about Pocahontas. Fact 01 She was born in Werowocommoco, Virginia. It is about 20 miles from Jamestown and also the home of her father, Powhatan. He was the tribal chief of more than 30 tribes. Fact 02 Her mother died giving birth of her and was later her father’s favorite child.. She had 26 other siblings. Fact 03 It was believed that her date of birth was March 21, 1595 but there are some inconsistencies about the year. Historians believed that it might have been between 1590 and 1596. Fact 04 Her other name was "Matoak," which means naughty or spoiled. Pocahontas was used commonly because their real names are kept secret for superstitious reasons. Fact 06 In 1607, the English started settling in Jamestown when she was around eleven years old. Fact 07 The story about Pocahontas saving John Smith’s head was believed to be a myth according to the historians. Fact 08 She first married a warrior named Kocoum before 1612 but there were no other information about their marriage. Fact 10 She learned the English language while she lived in Jamestown. She was baptized with a Christian name, Rebecca. Fact 12 Due to her popularity during her visit to England, she met the English royal family, Queen Anne and King James. For additional facts and information refer to the legend and the Story of Pocahontas. "Were you not afraid to come into my father's country, and caused fear in him and all of his people and fear you here I should call you father: I tell you I will, and you shall call me child, and so I will be forever and ever your countryman." “Your countrymen will lie much." "All must die. 'Tis enough that the child liveth." Pocahontas. Discover the vast selection of pictures on the subject of the tribes of Famous Native Americans such as Pocahontas. The pictures show the clothing, war paint, weapons and decorations of various Native Indian tribes, such as the Powhatan tribe of Pocahontas, that can be used as a really useful educational resource for kids and children of all ages studying famous Native Americans such as Pocahontas. We hope you enjoy watching the video - just click and play - a great educational resource for kids.